tribute to Leonidas, the king of Sparta in 480 BC. Armed with his mask, chest protector and goalie stick, goaltender Chris Mason is a latter day Leonidas, protecting the Nashville Predators' goal from the relentless attack of ornery tyrants from the rest of the NHL. Like Leonidas, the king of Sparta in 480 BC, Mason stands alone. The story of Leonidas and the 300 Spartan warriors at the Battle of Thermopylae resonates with Mason, who has used the skull plate on the back of his mask to honor Leonidas, who, along with the 300 warriors, valiantly held off an army of thousands of Persian troops until finally succumbing after several days of battling the enormous odds. "They build up the Spartan wall, and I thought that was relevant to my position as a goaltender," Mason said. "I really like that kind of era and think that movie (300) is pretty unbelievable." 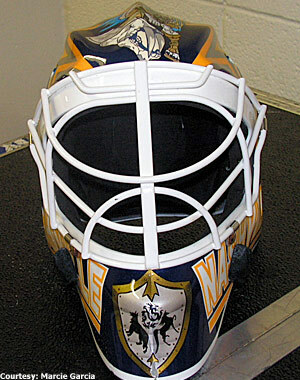 Mason's mask sports the traditional Predators' colors of navy blue, silver and gold. It was painted by Steve Nash, the owner and airbrush artist at EYECANDYAIR of Woodbridge, Ontario, a company that specializes in custom-made goalie mask painting. The company implemented Mason's ideas, creating an artwork that boasts an array of Mason's favorite things. 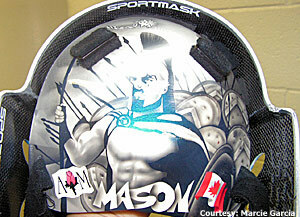 While Leonidas is depicted in battle form, Mason's family crest, his daughter Avery's initials, the Ring Tower that stands atop the Sommet Center and the Canadian flag also have places on Mason's mask. One would think such detail, including that of Mason's family crest, a representation of his wife, Courtney, and baby, Avery, would take months to make. Not the case, says Mason, thanks to the computer-friendly company that kept Mason in the loop throughout the entire process. "The mask I had before, I drew everything, including my family crest, and I wanted the artist to make it better,"Mason said. "These guys -- the artist, Steve Nash, was unbelievable -- and they talked to me about every little detail. Every little line, color, everything, was talked about. They'd send me the sketch in an e-mail and I would be blown away." One other work of art displayed on the top of Mason's mask is that of a Predators' skull and Kratos, the main character and a powerful Spartan warrior from the video game "God of War." "My roommate, Shea Weber, and I actually bring our PlayStation 2 on the road when we travel," he says. "I don't play as much anymore at home with my daughter, so that's why I bring it on the road. We finished six games last year, including God of War, God of War 2 and Scarface. We take turns and try to defeat the game as a single player. "It helps pass the time," he laughed. And the rest of his Predators teammates get in on the fun, too. Imagine stumbling in on a dozen tough hockey players in flight during a Predators road trip trying to best each other playing SOCOM, a multi-player shooter game based on U.S. Navy SEALs missions. Needless to say, the gaming Predators eagerly were anticipating Nov. 6, when a new version of the game was unveiled. "On the plane we all play our little PSPs (PlayStation Portable)," he says. "And the new SOCOM is coming out on Tuesday, so all 12 of us are going to get that before the next road trip." But some guys may need to practice a bit before they hit the road again. "They build up the Spartan wall, and I thought that was relevant to my position as a goaltender. I really like that kind of era and think that movie (300) is pretty unbelievable." "The worst at SOCOM -- well, it has to be Alexander Radulov," Mason admitted. "There are a couple who are bad, but he's the worst. But we do help each other out. If there's a certain part you're stuck on, we won't totally give it away, but we'll give him some clues because we can't just tell him." And though Mason has owned "everything" at one point or another, and currently owns an Xbox 360 as well, his favorite game today is Guitar Hero III Legends of Rock. "I got to do Welcome to the Jungle by Guns N' Roses, which is my favorite so far," he says. It's interesting to imagine Mason, the 6-foot, 195-pound Red Deer, Alberta native, who was selected in the fifth round (122nd overall) in the 1995 Entry Draft, do his best impression of Slash. But as fun as video games are, Mason realizes he has a very real multi-player interactive hockey game to play, too. It is by far his favorite game, a game he cannot shake after losing and one he can't forget after turning off the set, win or lose. And his stats? they can't be erased, no matter how much he'd like. After establishing an NHL career high in the 2006-07 season with a 24-11-4 record playing in tandem with Tomas Vokoun, Mason, 31, has struggled early on this season. In 10 starts, he is 3-7-0 with a 3.68 goals-against average and .878 save percentage. Like his alter ego, Leonidas, Mason isn't close to surrendering. Instead, he will forge ahead and do battle for himself and his Predators.